As a world leading supplier of hazardous and industrial area electrical, lighting and control gear products, Hubbell Scotland’s systems are renowned for delivering leading performance in extreme environments. Installed in some of the most arduous and safety critical locations worldwide, Hubbell Scotland provides a complete package of electrical solutions to some of the toughest environments on the planet, from oil installations in the North Sea to refinery operations in the Middle East. With approximately 60 employees at its Glasgow site, covering roles such as engineering and assembly with operatives carrying out tasks including spot welding, high pressure water applications, testing, grinding and pedestal drilling, Hubbell wanted to ensure its staff were also able to work safely and effectively at all times. 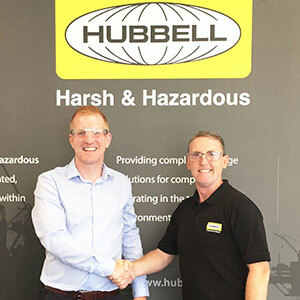 Despite relatively few eye hazards on the shop floor Hubbell’s parent company, Hubbell Incorporated made the decision to implement a mandatory safety eyewear policy programme across its operations. To help them achieve this, Hubbell Scotland turned to performance safety eyewear specialist Riley® (part of Globus Group) who provided its workers with its convenient ‘On Sight’ eye care service. Working with Hubbell Scotland’s HSE Manager Brian Barr, the Riley team spent two days at its premises with its ‘On Sight’ service – consisting of a state of the art, fully equipped mobile optician vehicle with an appointment given to each worker to have their eyes tested. Eye tests were carried out on every worker to determine their eye health, provide the right safety eyewear and to ensure that workers with prescription eyewear requirements were provided with leading safety solutions that matched their specific needs. Being able to test people in the workplace ensured very little disruption or inconvenience resulted for the workforce whilst also minimising any downtime. Able to offer workers a much wider choice of prescription safety frames – many more than a typical high street optician – the ‘On Sight’ service was a real success. But the greatest benefit went far beyond the enhanced duty of care Hubbell wanted to provide to its workers. For little did anyone think that one of Hubbell Scotland’s workers would have a serious eye health issue identified by the Riley service that, if left untreated would have led to the loss of his sight in one eye. During an eye test conducted on Hubbell Scotland’s Production Supervisor, Riley’s optometrist identified a problem and the individual was immediately sent to hospital. A deeper macular degenerative matter, which he was completely unaware of was diagnosed and emergency treatment was given. “The Riley eye care test picked up a problem, which if left untreated would have meant I would have lost my sight in one eye. I am extremely thankful as without the Riley service the end result could have been significantly worse and had far more serious consequences to me and my life,” said the Production Supervisor. The Riley ‘On Sight’ eye care service has also been praised by Brian Barr, who believes it provides a number of measureable benefits. “The expert service, saved time, was convenient for us and the workforce really saw the health benefits of us carrying out the tests. The Riley team are specialist in their field. We get high performance products for our workforce and in the case of our Production Supervisor – to identify a potentially life changing issue was testament to just how beneficial the service is.” said Brian. “Sometimes going to the optician is a job that gets put down the list of people’s priorities, but our workers loved the fact they did not need the inconvenience of arranging an eye test themselves and in their own time and it was all done for them by qualified personnel at work. It was a real win-win.” he added.